Compare to Uline S-5131 and Save! Ideal as vapor barrier or drop cloth, our 4 Mil 6' x 100' clear plastic sheeting on roll is provided in continuous rolls of durable low density polyethylene. 4 Mil heavy weight clear poly sheeting is commonly used in application as construction film and agriculture film where great protection from weather and debris is needed. 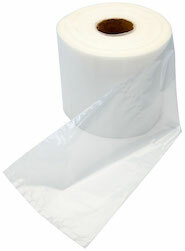 C & A film is wound and folded on rolls for easy dispensing.